How do IT, Manufacturing and Retail Businesses Improve Customer Service Efficiency? Call answering solutions go through various dispositions to understand the call volume, level of importance of the call, and where the call should be queued. Should the call route directly to the associate or forward to the telephone answering service for a later response? 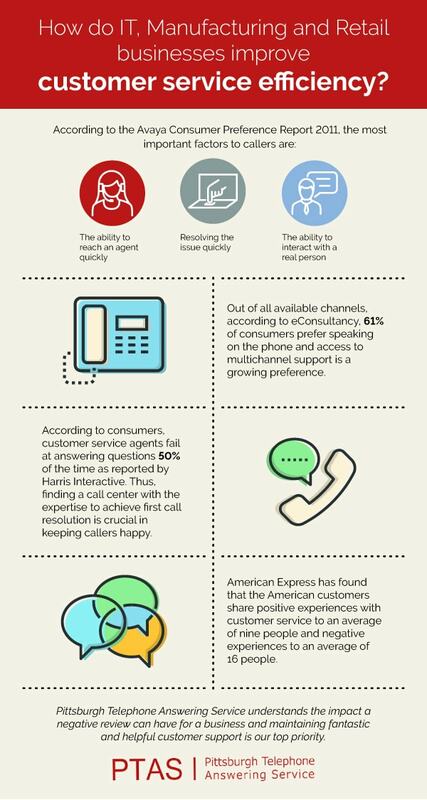 The infographic below outlines the call flow. Technology has vastly improved how we live; however, new users often have questions. IT questions from customers can range from minor problems to intricate issues that quickly become very technical. Regardless of the issue, IT customer calls are usually paired with frustration which can escalate if not handled properly. Many IT developers are confronted with the challenge of balancing time, efforts and personnel between creating new products and customer support. Properly handling a frustrated caller by knowing how to identify the level of importance for each call and knowing where a call should be queued can drastically improve an IT business’ call flow by managing calls and ensuring that calls are answered quickly and correctly. This, in turn, provides developers more time and attention to focus on creating and enhancing products. Customer satisfaction is perhaps the most critical component to the success of a manufacturing business. A large factor in ensuring customer satisfaction deals with not only properly handling the answering of calls but also maintaining a positive brand identity. Preserving a positive brand identity starts with customer interactions. By outsourcing customer support calls to a call answering service that is experienced in providing stellar customer service, manufacturing businesses save time by not having to manage calls or needing to train employees on proper call flow and call management. This also ensures that customers will speak positively of their experience and help strengthen their brand loyalty in addition to acquiring loyalty from customers’ family and acquaintances. Online shopping has presented retail businesses with new challenges on managing calls. Call flow patterns are rapidly changing as online customers are not able to ask questions about products at the point of purchase. These challenges are creating growing demands for superb customer support and immediacy in finding answers. In the age of busy schedules, instant gratification, and constant urgency, retailers are often faced with customers who want to address their questions or complaints with speed and accuracy. A telephone answering service knows how to manage calls properly and create a call flow pattern that will best meet the specific needs of varied retailers. As an experienced answering service, at Pittsburgh Telephone Answering Service, we train all of our representatives thoroughly to help them understand how to better assist your callers. The goal is always to have the caller feel so well taken care of that they believe they are speaking to a member of your own team. If you are interested in discussing the services available to your IT, manufacturing or retail business, contact Pittsburgh Telephone Answering Service today.